EO introduces Everyone Lotion - an ultra moisturizing lotion made with pure essential oils and herbal extracts to keep your skin soft and smooth. Everyone Lotion is a ​3 in 1 lotion: Face, Hands, Body – light enough for your face and hydrating and moisturizing enough for hands and body. Soothes and softens skin for the whole family. Ingredients: Purified Water, Vegetable Glycerin, Organic Cocos Nucifera (Coconut) Oil, Glyceryl Stearate, Caprylic/Capric Triglyceride, Cetearyl Olivate, Sorbitan Olivate, Stearyl Alcohol, Organic Sesamum Indicum (Sesame) Seed Oil, Tocopherol, Phospholipids, Cetyl Alcohol, Cetyl Esters, Hydrolyzed Rice Protein, EO® Organic Herbal Blend [Organic Aloe Barbadensis Leaf, Organic Chamomilla Recutita (Matricaria) Flower Extract, Organic Calendula Officinalis Flower Extract, and Organic Camelia Sinensis Leaf Extract], EO® Essential Oil Blend [Lavandula Angustifolia (Lavender) Oil, Lavandula Hybrida Oil], Xanthan Gum, Sodium Phytate, Dimethicone, Citric Acid, Phenoxyethanol, Benzyl Alcohol, Potassium Sorbate. Love this product! I have Ben using it for a few years now ! Doesnâ€™t feel greasy . Love this lotion! The smell is great....a true lavender scent. Goes on easily and is quickly absorbed. My favourite thing about this is that it does not leave any greasy residue behind. Most lotions do. The scent is strong at first, but, right away, is very light. I like that, because I don't like strong scents. Nice big bottle, natural ingredients, nice for dry bodies/faces here on the frozen Canadian prairies, with our looooong winters! This is my go to lotion for every washroom in the house all year round now. It's light yet moisturizes well from dry hands to face, without a heavy scent or greasy feel. Safe ingredients to use on everyone in the household and no one feels overpowered by the lavender essential oil which is not synthetic as in other brands can be. Great lotion for year round moisture. Authentic lavender scent and natural ingredients. Absorbs quickly and is not greasy. Great value, will continue to purchase. Very good value and volume for your $: the scent is 'real' without cloying and the lotion absorbs quickly. I use this line of product for guest bathroom also. Very happy with this moisturizer. I use it every day and it lasts a very long time. Loving this lotion!! I only use it for my body (not my face). Absorbs quickly and keeps my skin moisturized all day! My skin doesn't at all look/feel dry. The scent is not amazing but it absorbs quickly and the smell goes away. Highly recommend! I LOVE this lotion! Finally a product that works for my skin! My legs have always been rough and dry no matter what I use, but after using this lotion my legs are finally nice!! Highly recommend! Love this lotion. Great scent, not too thick, absorbs well. Love this lotion. It's the third time I buy it. Nongreasy, light, perfect. Great product. Why pay more? I love the price of this cream mostly because of how long it lasts me, usually 3-5 months. I use it everywhere but on my face. My skin never feels dry even in the winter. I personally really like the smell but it is not a perfume type of smell, more like essential oils. It's not greasy and it absorbs quickly on to the skin. Love this cream!! The smell is my Favorite!! The lavender smell goes on strong but does not stay long after applied. Very hydrating and would definitely recommend!! Really nice! Light fragrance. Non-greasy and natural. Reasonably priced! Glad I discovered it! This Everyone Lotion Lavender & Aloe is a favourite in our household. The fragrance is subtle, the lotion is fast absorbing without being greasy, and the price is wonderful. A fantastic product. Switched to this lotion a year ago and will never go back to Aveeno or other store brands. Saturates into skin quickly, non greasy, great smell, not too thick. Large pump lasts me 6 months with every day use. Use on hands, body & sometimes face. Awesome delightfully scented all natural lotion that you can truly use all over! Love this product! I loved my Lemon Coconut cream so much that I shipped this one to my mom to try. She absolutely loved it! This body lotion is lovely! Nice scent, light-weight and perfect for all over. Love everything about this product! I love this lotion! The scent is very calming and perfect for bedtime. It leaves our skin feeling soft and smooth! This is a nice light lotion, it is perfect for summer. I have to use a thicker cream for the winter months as this just doesn't cut it. I will repurchase this product as it has become a part of my night time ritual. Awesome! The price is great for such a clean product. I use it on my body and face. We've even used in on our baby's bum and it's cleared up his diaper rash! This is a great, cruelty-free product that I use daily. The scent is lovely and not at all cloying. My go-to moisturizer. The most absorbable skin friendly lotion I have used in a while. The lavender addition is lovely! Works great. Smells great. Natural. Win. Win. Win! I have been using this lotion for a few years, it's nice, light, absorbs well and has a pleasant & natural lavender scent. I really like this lotion it's fast absorbing and not greasy and it prolongs moisture. My tween granddaughter and her family loves it! My daughter approved and she is pretty fussy when it comes to lotions on her children. I use this lotion every night before bed. The amount you get for the price is fantastic and it is cleaner than the regular store brands. The scent is a natural Lavender and i am obsessed with it. Highly recommend this lotion for anyone. 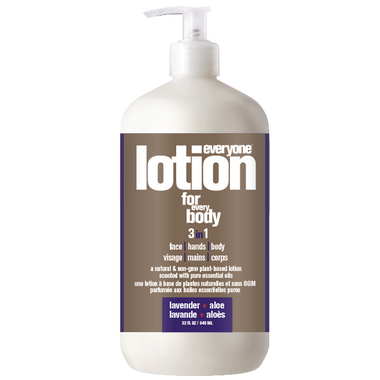 I love this lotion- tons of product, pump dispenser, amazing scent, and it's natural. The lavender fragrance is strong, but pleasant. I put it on before bed and it's really relaxing. Great moisturizer. Smells amazing and value for size is good too. Love that it's natural. Boyfriend enjoys this lotion as well! One of the best discoveries! Goes on light and works well. I love that is versatile and could be used by everyone, everywhere. EO lotion is my fave. Doesn't smell artificial and good ingredients. This is a nice non greasy lotion... only downside is the lavender's exaggerating smell. I really like this product and the simple ingredients, it just doesn't seem to last very long and I need to reapply. Smells amazing though, and I like the easy to read labelling- I don't need to do any further research to know this product fits my requirements for being gluten free and safe for animals and the environment! A wonderful softly fragrant lotion. I even use it on my face. Use the coconut lemon one for day and this Lavender / Aloe one at night to help me relax. Would highly recommend. This is a lovely lotion in every way. It's an opaque-white, light lotion, not heavy or thick nor greasy. It absorbs quickly and leaves my skin silky smooth. The scent is soft and, of a true lavender. Not long after being rubbed in does the scent soon remind me of the long-ago bar of "Baby's Own" soap...which I very much liked the scent of. The one drawback for me is not enough moisturizing ingredients to fully soothe and protect dry skin long term. I found, that you will need to re-apply this lotion after each hand-washing even if using a mild soap like 'Dove'. Slightly strong lavender fragrance, but a very rich lotion without bad ingredients. Great value for the giant bottle! I love this product. This product was recommended to me by my daughter and I am so glad! I started with lavender because it is a favourite fragrance of time. I will definitely be trying the rest of the product line in time.